I've been working on a new quilt for our bed and the first step, after cutting, was making 40 sets of 4 flying geese with the no-waste method. 40 sets of 4! That's 160 geese, so it's a lot of line marking, a lot of chain piecing, which I don't mind at all, and then a lot of pressing, which gets mind-numbingly boring very quickly. Once it was time to assemble the blocks, I had to start pressing all of the seams open, which I find tedious because it takes so much longer than just pressing them to the side. Chain piecing is fast and efficient, but chain pressing those seams open is just repetitive and boring. It makes me glad I don't work on an assembly line, doing one small task for hours on end, day after day after day. Sometimes it can seem like the job God has given us to do is repetitive and boring. We're just doing the same thing over and over and it doesn't seem like we're getting anywhere. It's like being stuck in an endless chain of seams to press open, except we can't see the end of the job because we're not in control of that part of it. Often in the Bible, sharing the word of God is compared to planting a seed, but Paul takes it a step farther in 1 Corinthians 3:5-9: "Each of us did the work the Lord gave us. I planted the seed in your hearts, and Apollos watered it, but it was God who made it grow. It’s not important who does the planting, or who does the watering. What’s important is that God makes the seed grow. The one who plants and the one who waters work together with the same purpose. And both will be rewarded for their own hard work. For we are both God’s workers." Paul planted the seed and Apollos watered it. I wonder if one or the other of them ever got tired of always doing the same thing, whether that was telling people about God or teaching them a little more than they already knew. Did they ever feel like they weren't really getting anywhere with the people they were teaching? After all, if Paul was always planting seeds that needed to be watered by someone else, then he wouldn't necessarily see the results of his work. God has given each of us a role to play in teaching others about Him. For some of us, that's introducing people to Jesus. For others, it's helping new believers learn more about Him. For others, their hope, joy and perseverance through suffering attracts people and makes them curious about the source of that response. Whatever our role, it can sometimes feel repetitive and boring to be always doing that same job. But the beautiful thing is that, whatever role we play, if we are faithful to continue doing the work, we can be sure that God will make those seeds grow. 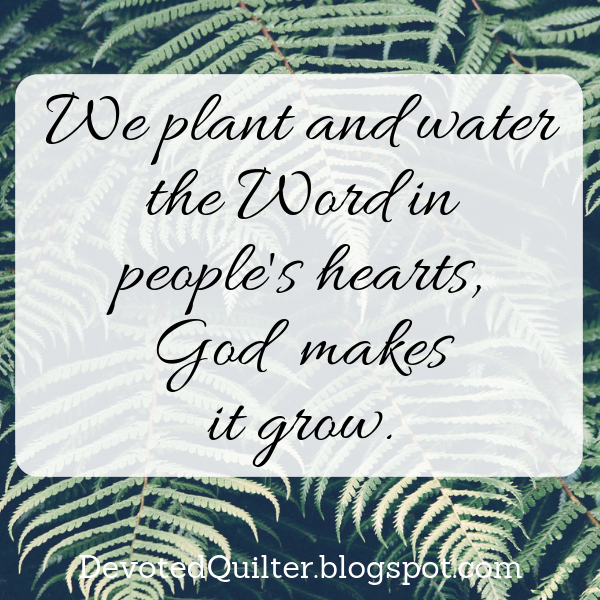 Whether we have been planting or watering the word of God in the hearts of others, when God makes those seeds grow it will be beautiful to see.